A New York congressman is proposing legislation that would require cell phone companies to implement kill switches in smart phones. Supposedly, it would increase safety from theft, but opponents of the bill say that it could subject people to hackers or terrorists. When you are at war, one smart first move is to eliminate your opponents ability to communicate with each other. This legislation should make us all uneasy that communication between Americans can be seriously hindered in a time when our government is working to hard to get rid of our Second Amendment and as well as the rest of the Constitution. Many see civil war on the horizon. Has the fighting not already begun? 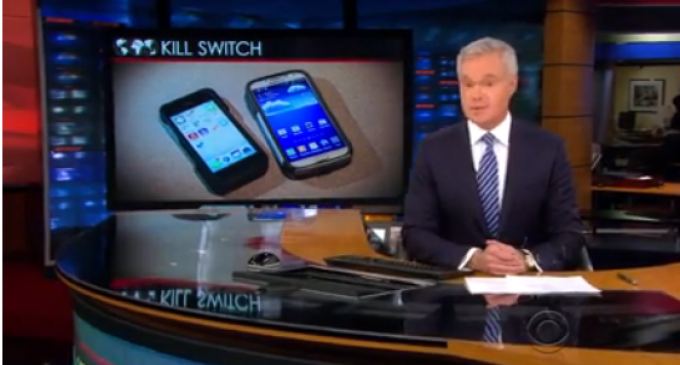 A New York congressman is proposing legislation that would require kill switches to be installed in smart phones. The bill comes under the pretense that it would increase safety from theft, but opponents of the bill say that it could subject people to hackers or terrorists. California and Illinois state lawmakers are considering similar legislation, proposing bills to require kill switches in phones, while mobile carriers are opposing the mandatory changes, allegedly because doing so might cut into sales of replacement phones. New York City Police Commissioner William Bratton said ”The elephant in the room is all about corporate greed, profit, that’s what this is all about – they’re making 30, 40 billion dollars a year on new phone sales,” he said. The cell phone industry is disputing that, claiming that it has to do with security issues. Hackers could misuse the switches. And Apple has already introduced security features such as “Find my iPhone” as well as “Activation Lock,” which can make a phone useless when stolen. The government has absolutely zero business interfering with the private property of our citizens. Smartphone kill switches have nothing to do with government security and so there is no reason for this type of legislation considering that private companies already offer this feature voluntarily. This is merely another attempt at an unconstitutional power grab by the government in our private lives and our commercial transactions. Government should stick to politics and leave the publics phones alone ! The real reason they want control of the phones is to spy on us and I’m not paranoid about this statement . Each and every phone has a unique serial number called an IMEI (International Mobile Equipment Indicator) or ESN (Electronic Serial Number) that you give to the phone company to register your phone. Every phone company can easily ban these phones. PHONE COMPANIES REFUSE to this and lose money. MORE gov’t intrusion. We’re getting closer to the Second American Revolution. They can already shut off cell service in an area if they want. Stories were abundant after the Boston bombing, but apparently it was just very spotty because of the system being overloaded. The lines would be definitely overloaded in an “emergency”. What do we do with no telephone service?????? ?